Ryan Berndt is one of the trumpet players of the Gaudete Brass. He has performed and recorded with numerous ensembles including the Silk Road Ensemble, Chicago Civic Orchestra under the direction of Daniel Barenboim and Jay Friedman. In addition, Ryan has can be heard on all three of the album’s recorded with the Gaudete Brass Quintet. The latest album “Chicago Moves” was released on Cedille Records, where he is a Cedille Recording Artist. He has performed internationally along side trumpeter, James Morrison, at the Sydney Opera House in Sydney, Australia and at the Isao Satoshi in Kurashiki, Japan. Outside of classical music, he has performed with the National High School cast for the musical Thoroughly Modern Millie and toured with the Regis Philbin Big Band. 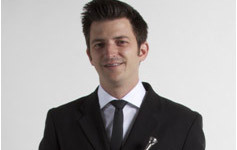 Ryan has taught trumpet at the University of Notre Dame and St. Mary’s College in South Bend, Indiana and is currently the Trumpet Faculty Chair at the New Music School in Chicago. He has given concerts and masterclasses at the top Conservatories and Universities in the country, including Juilliard, Cal Arts and the Eastman School of Music. Ryan is also serves as Artist Faculty at Roosevelt University, where Gaudete Brass is in residence. Ryan is a graduate of the Chicago College of Performing Arts where he earned an Artist Diploma in Orchestral Studies. He also earned degrees of Master of Music in Performance and Literature from the University of Notre Dame and a Bachelor of Music from Saint John’s University in Collegeville, MN.